Alighiero Boetti (1940–1994) was one of the most important and influential Italian artists of the twentieth century. He was a key member of the Arte Povera group of young Italian artists in the late 1960s which was working in radically new ways using simple materials. 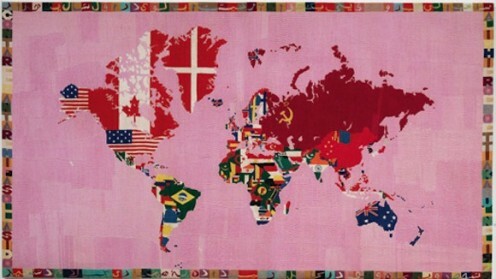 Boetti used industrial materials associated with Turin’s booming economy and later made works using postage stamps, biro pens, and magazine covers. His work engaged with the changing geopolitical situation of his time, much of it made on his travels to places such as Ethiopia and Guatemala and Afghanistan. Between 1971 and 1979 he set up a hotel in Kabul as an art project and created large colourful embroideries, the most famous of these were the Mappa, world maps in which each country features the design of its national flag. Highlights include works never seen in the UK such as the iconic Self-Portrait (1993), a life-size bronze cast of the artist hosing his head with a jet of water.